SUBHEAD: At this point, electing Green-minded leaders is the only realistic path to a habitable planet. 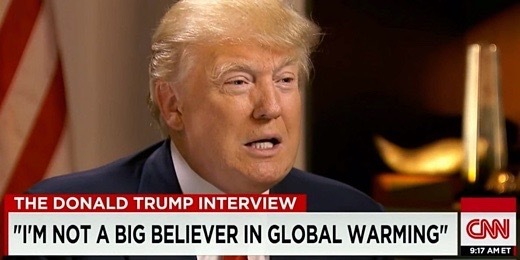 Image above: US Presidential candidate Donald Trump "I'm not a big believer in Global Warming". From (http://www.businessinsider.com/bill-nye-great-response-donald-trump-statements-climate-change-2016-1). In a year of record-setting heat on a blistered globe, with fast-warming oceans, fast-melting ice caps, and fast-rising sea levels, ratification of the December 2015 Paris climate summit agreement -- already endorsed by most nations -- should be a complete no-brainer. That it isn't tells you a great deal about our world. Global geopolitics and the possible rightward lurch of many countries (including a potential deal-breaking election in the United States that could put a climate denier in the White House) spell bad news for the fate of the Earth. It’s worth exploring how this might come to be. The delegates to that 2015 climate summit were in general accord about the science of climate change and the need to cap global warming at 1.5 to 2.0 degrees Celsius (or 2.6 to 3.5 degrees Fahrenheit) before a planetary catastrophe ensues. They disagreed, however, about much else. Some key countries were in outright conflict with other states (Russia with Ukraine, for example) or deeply hostile to each other (as with India and Pakistan or the U.S. and Iran). In recognition of such tensions and schisms, the assembled countries crafted a final document that replaced legally binding commitments with the obligation of each signatory state to adopt its own unique plan, or “nationally determined contribution” (NDC), for curbing climate-altering greenhouse gas emissions. That geopolitics will play a decisive role in determining the success or failure of the Paris Agreement has become self-evident in the short time since its promulgation. While some progress has been made toward its formal adoption -- the agreement will enter into force only after no fewer than 55 countries, accounting for at least 55% of global greenhouse gas emissions, have ratified it -- it has also encountered unexpected political hurdles, signaling trouble to come. On the bright side, in a stunning diplomatic coup, President Obama persuaded Chinese President Xi Jinping to sign the accord with him during a recent meeting of the G-20 group of leading economies in Hangzhou. Brazil, the planet's seventh largest emitter, just signed on as well, and a number of states, including Japan and New Zealand, have announced their intention to ratify the agreement soon. Many others are expected to do so before the next major U.N. climate summit in Marrakesh, Morocco, this November. On the dark side, however, Great Britain’s astonishing Brexit vote has complicated the task of ensuring the European Union’s approval of the agreement, as European solidarity on the climate issue -- a major factor in the success of the Paris negotiations -- can no longer be assured. “There is a risk that this could kick EU ratification of the Paris Agreement into the long grass,” suggests Jonathan Grant, director of sustainability at PricewaterhouseCoopers. The Brexit campaign itself was spearheaded by politicians who were also major critics of climate science and strong opponents of efforts to promote a transition from carbon-based fuels to green sources of energy. For example, the chair of the Vote Leave campaign, former Chancellor of the Exchequer Nigel Lawson, is also chairman of the Global Warming Policy Foundation, a think-tank devoted to sabotaging government efforts to speed the transition to green energy. Many other top Leave campaigners, including former Conservative ministers John Redwood and Owen Paterson, were also vigorous climate deniers. In explaining the strong link between these two camps, analysts at the Economist noted that both oppose British submission to international laws and norms: “Brexiteers dislike EU regulations and know that any effective action to tackle climate change will require some kind of global cooperation: carbon taxes or binding targets on emissions. In his first major speech on energy, delivered in May, Trump -- who has called global warming a Chinese hoax -- pledged to “cancel the Paris climate agreement” and scrap the various measures announced by President Obama to ensure U.S. compliance with its provisions. He also vowed to revive construction of the Keystone XL pipeline (which would bring carbon-heavy Canadian tar sands oil to refineries on the U.S. Gulf Coast), to reverse any climate-friendly Obama administration acts, and to promote the coal industry. “Regulations that shut down hundreds of coal-fired power plants and block the construction of new ones -- how stupid is that?” he said, mockingly. In Europe, ultra-nationalist parties on the right are riding a wave of Islamaphobia, anti-immigrant sentiment, and disgust with the European Union. In France, for instance, former president Nicolas Sarkozy announced his intention to run for that post again, promising even more stringent controls on migrants and Muslims and a greater focus on French “identity.” Even further to the right, the rabidly anti-Muslim Marine Le Pen is also in the race at the head of her National Front Party. Like-minded candidates have already made gains in national elections in Austria and most recently in a state election in Germany that stunned Merkel’s ruling party. In each case, they surged by disavowing relatively timid efforts by the European Union to resettle refugees from Syria and other war-torn countries. Although climate change is not a defining issue in these contests as it is in the U.S. and Britain, the growing opposition to anything associated with the EU and its regulatory system poses an obvious threat to future continent-wide efforts to cap greenhouse gas emissions. Prime Minister Narendra Modi of the Hindu nationalist Bharatiya Janata Party (BJP) has indeed voiced support for the Paris accord and promised a vast expansion of solar power. He has also made no secret of his determination to promote economic growth at any cost, including greatly increased reliance on coal-powered electricity. That spells trouble. According to the Energy Information Administration of the U.S. Department of Energy, India is likely to double its coal consumption over the next 25 years, making it the world’s second largest coal consumer after China. Combined with an increase in oil and natural gas consumption, such a surge in coal use could result in a tripling of India’s carbon dioxide emissions at a time when most countries (including the U.S. and China) are expected to experience a peak or decline in theirs. Prime Minister Modi is well aware that his devotion to coal has generated resentment among environmentalists in India and elsewhere who seek to slow the growth of carbon emissions. He nonetheless insists that, as a major developing nation, India should enjoy a special right to achieve economic growth in any way it can, even if this means endangering the environment. Russia is similarly likely to put domestic economic needs (and the desire to remain a great power, militarily and otherwise) ahead of its global climate obligations. Although President Vladimir Putin attended the Paris summit and assured the gathered nations of Russian compliance with its outcome, he has also made it crystal clear that his country has no intention of giving up its reliance on oil and natural gas exports for a large share of its national income. According to the Energy Information Administration, Russia’s government relies on such exports for a staggering 50% of its operating revenue, a share it dare not jeopardize at a time when its economy -- already buffeted by European Union and U.S. sanctions -- is in deep recession. To ensure the continued flow of hydrocarbon income, in fact, Moscow has announced multibillion dollar plans to develop new oil and gas fields in Siberia and the Arctic, even if such efforts fly in the face of commitments to reduce future carbon emissions. Such nationalistic exceptionalism could become something of the norm if Donald Trump wins in November, or other nations join those already eager to put the needs of a fossil fuel-based domestic growth agenda ahead of global climate commitments. With that in mind, consider the assessment of future energy trends that the Norwegian energy giant Statoil recently produced. In it is a chilling scenario focused on just this sort of dystopian future. The second-biggest producer of natural gas in Europe after Russia’s Gazprom, Statoil annually issues Energy Perspectives, a report that explores possible future energy trends. Previous editions included scenarios labeled “reform” (predicated on coordinated but gradual international efforts to shift from carbon fuels to green energy technology) and “renewal” (positing a more rapid transition). The 2016 edition, however, added a grim new twist: “rivalry.” It depicts a realistically downbeat future in which international strife and geopolitical competition discourage significant cooperation in the climate field. In such a future, Statoil suggests, the major powers would prove to be far more concerned with satisfying their own economic and energy requirements than pursuing collaborative efforts aimed at slowing the pace of climate change. For many of them, this would mean maximizing the cheapest and most accessible fuel options available -- often domestic supplies of fossil fuels. Under such circumstances, the report suggests, the use of coal would rise, not fall, and its share of global energy consumption would actually increase from 29% to 32%. In such a world, forget about those “nationally determined contributions” agreed to in Paris and think instead about a planet whose environment will grow ever less friendly to life as we know it. In its rivalry scenario, writes Statoil, “the climate issue has low priority on the regulatory agenda. While local pollution issues are attended to, large-scale international climate agreements are not the chosen way forward. Coming from a major fossil fuel company, this vision of how events might play out on an increasingly tumultuous planet makes for peculiar reading: more akin to Eaarth -- Bill McKibben’s dystopian portrait of a climate-ravaged world -- than the usual industry-generated visions of future world health and prosperity. And while “rivalry” is only one of several scenarios Statoil’s authors considered, they clearly found it unnervingly convincing. Hence, in a briefing on the report, the company’s chief economist Eirik Wærness indicated that Great Britain’s looming exit from the EU was exactly the sort of event that would fit the proposed model and might multiply in the future. Indeed, the future pace of climate change will be determined as much by geopolitical factors as by technological developments in the energy sector. While it is evident that immense progress is being made in bringing down the price of wind and solar power in particular -- far more so than all but a few analysts anticipated until recently -- the political will to turn such developments into meaningful global change and so bring carbon emissions to heel before the planet is unalterably transformed may, as the Statoil authors suggest, be dematerializing before our eyes. If so, make no mistake about it: we will be condemning Earth’s future inhabitants, our own children and grandchildren, to unmitigated disaster. As President Obama’s largely unheralded success in Hangzhou indicates, such a fate is not etched in stone. If he could persuade the fiercely nationalistic leader of a country worried about its economic future to join him in signing the climate agreement, more such successes are possible. His ability to achieve such outcomes is, however, diminishing by the week, and few other leaders of his stature and determination appear to be waiting in the wings. To avoid an Eaarth (as both Bill McKibben and the Statoil authors imagine it) and preserve the welcoming planet in which humanity grew and thrived, climate activists will have to devote at least as much of their energy and attention to the international political arena as to the technology sector. At this point, electing green-minded leaders, stopping climate deniers (or ignorers) from capturing high office, and opposing fossil-fueled ultra-nationalism is the only realistic path to a habitable planet. • Michael T. Klare, a TomDispatch regular, is a professor of peace and world security studies at Hampshire College and the author, most recently, of The Race for What’s Left. A documentary movie version of his book Blood and Oil is available from the Media Education Foundation. Follow him on Twitter at @mklare1.